The Mobile Integrated Healthcare (MIH) Team began projects in 2018 to address needs in the community related to opioid usage. The first program was a follow-up visit by the MIH Manager to patients who had recently overdosed. This program is called Knock and Talk. Each visit includes education about the use of Narcan and kit that contains two doses of Narcan. The MIH program works with Drug Overdose Prevention Program Specialist Emily Schmidt to provide the Narcan at no cost to the patients. The program expanded late last year to include education and Narcan to small groups and gatherings in at-risk neighborhoods and events. These small group trainings have, in turn, expanded to requests for education and Narcan by individuals in need. This opportunity would not be possible without the Narcan provided by the Winnebago County Health Department through the hard-working Emily Schmidt. MIH Manager Shannon Kopp provides Narcan training at Miss Carly's in Rockford. Our next group training will be held in conjunction with the ADMIT Rockford meeting on Wednesday, March 6th at 8:00 am at Amberwood Nursing Home. ​We are in the process of setting up training for 2019. If you or a group you are affiliated with would like to Narcan training please contact us by e-mail or by phone. The MIH (Community Paramedic) Team was presented the Henry C. Anderson Quality Award at the annual Associate Recognition Dinner on Friday, June 8th at the UW Sports Center. The Award is presented annually to a SwedishAmerican employee, physician, or team for their outstanding contributions toward our pursuit of quality excellence. Dr. Henry C. Anderson practiced medicine in Rockford for more than 40 years. 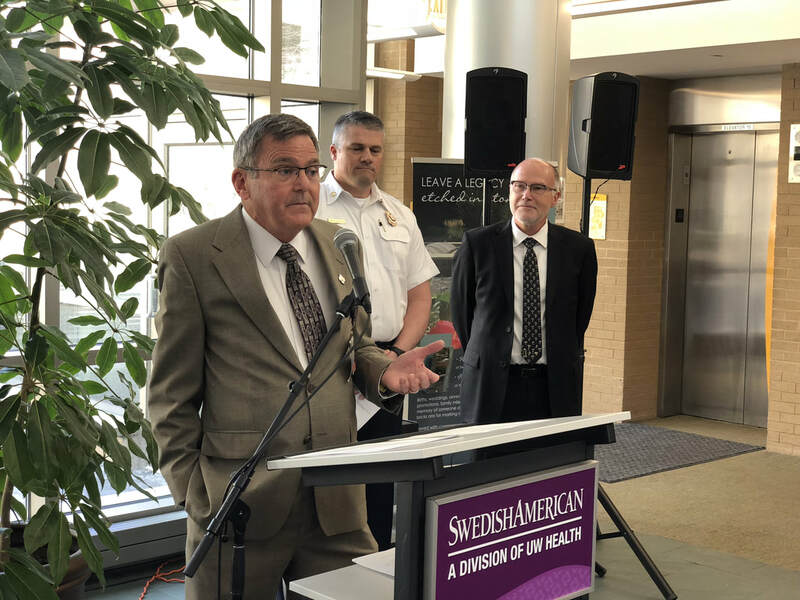 As SwedishAmerican’s Vice President of Medical Affairs and Chief Quality Officer from 1989-2002, he led our quality initiatives which resulted in our designation as a Top 100 Hospital, recipient of the Lincoln Award for Excellence, and the National Quality Cup winner from USA Today. Team members include: Sue Thompson, Chad Thompson, Elizabeth EauClaire, Paula Keehn, Jennifer Thammavong, Marcia Maggio, Dr. John Underwood, Danielle Folk,, and Catherine Lewis from SwedishAmerican and Brian Park, Shannon Kopp, Trent Brass, Bob Vertiz, and Chief Derek Bergsten from Rockford Fire. 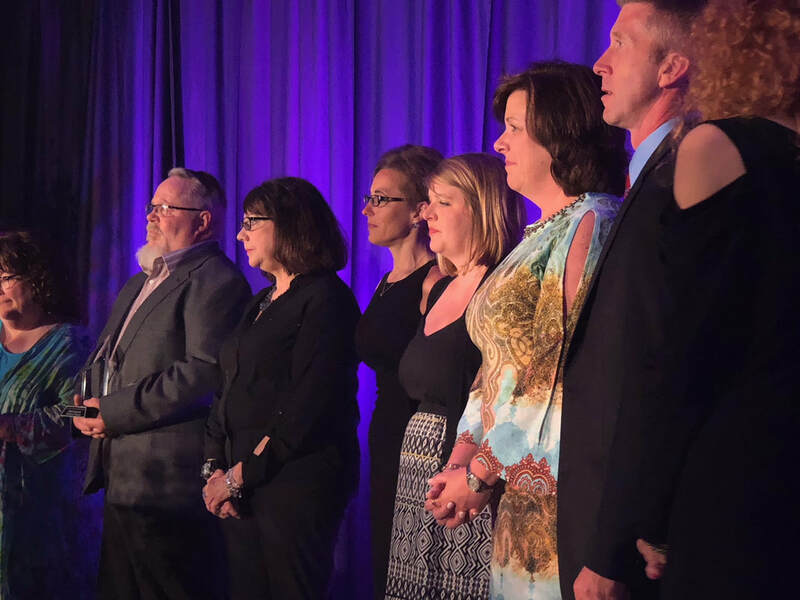 On stage to accept the award are: Cat Lewis, Tom Pratt, Paula Keehn, Liz EauClaire, Jennifer Thammavong, Sue Thompson, Trent Brass, and Marcia Maggio. Please welcome Shannon Kopp from Rockford Fire as our newest Mobile Integrated Healthcare (Community Paramedic) Program Manager! Thank you to Brian and Shannon from Rockford Fire and to Liz EauClaire and Paula Keehn, our SwedishAmerican Emergency Department Case Managers for all they do for our patients. 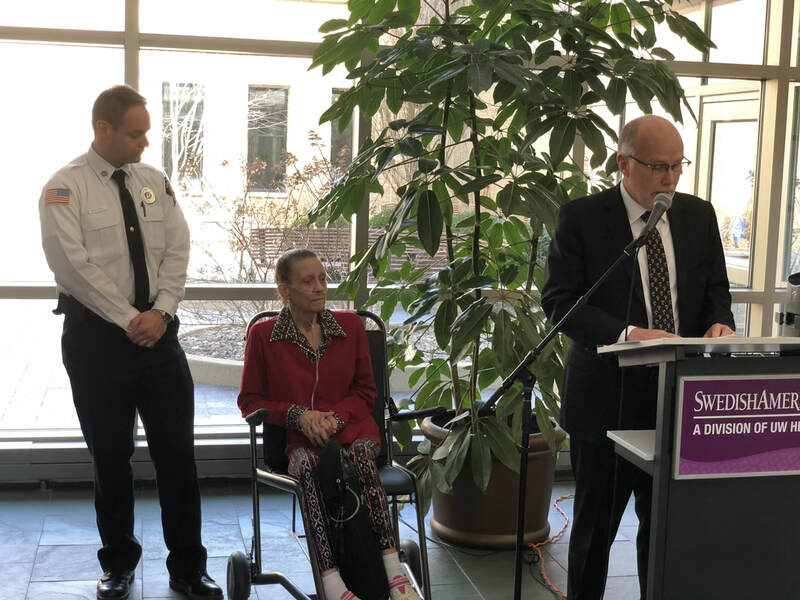 Photo Above: Trent Brass, EMS Coordinator, Rockford Fire, MIH patient Nancy, and Brian Park, MIH Manager at the recent press conference.